Workers who are covered by long-term disability (LTD) insurance may be entitled to get their benefits if they have started to suffer from its debilitating symptoms that eventually prevent them from earning a living. Individuals who have a disease like Huntington’s Disease may no longer be able to provide for the financial needs of their family because disabling symptoms usually manifest between the age of 30 and 40. The disease happens when the nerve cells in the brain start to deteriorate and individuals who have it may suffer from the following disabling symptoms that could prevent them from doing any kind of jobs. Though Huntington’s disease has no cure, there are various medications that are available to possibly manage its symptoms. In some situations, individuals may be required to undergo therapy sessions to possibly improve their mental and physical capabilities. Sadly the disabling symptoms of Huntington’s disease are difficult to prove when filing for long term disability benefits. 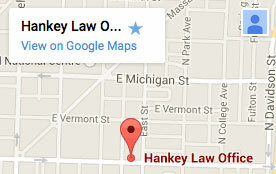 However, if you are in such situation in Indiana, an attorney of the Hankey Law Office may represent you. Find out how we may help you strengthen your LTD claims today by calling (800) 520-3633.